Remember my post about the Vancouver tree killer? There’s more news, and it makes me shake my head. 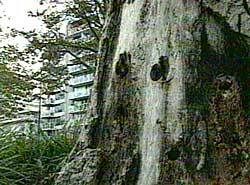 The woman who is accused of drilling holes in five mature trees along a waterfront park to improve the view from her condominium view is 71 years old. She sold the condo, complete with view, for nearly $1.7 million dollars. Whatever happened to the tradition of planting trees as a legacy to future generations? Now we’ve got elderly folks killing trees to create views they won’t enjoy for long, to fatten up bank accounts they won’t be taking with them. VANCOUVER — A woman accused of poisoning trees in English Bay was to appear in court Thursday, but sent a legal representative instead. June Matheson, 71, is charged with mischief over $5,000 in relation to an incident early this year. Someone drilled holes in five trees along Beach Avenue and poured herbicide into them, causing three of them to die off this summer. The damaged trees are directly in front of a condominium Matheson sold this year for nearly $1.7 million, double the price it fetched nine years ago. People who live in the area are still angry about the vandalism, and several showed up at provincial court Thursday morning hoping to send a message. Matheson is a prominent interior designer and owner of J Interiors on south Granville Street. Global News tried to contact her there but she was unavailable for comment. An agent for her lawyer, Ian Donaldson, spoke on her behalf Thursday but Matheson herself was not present. Matheson’s next court appearance is scheduled for Jan. 7. She is a real number – this one! Do not shop at her stores – pass it on!